Thank you for your interest in adopting your new four-legged family member from B.A.A.R.K. Dog Rescue. Adopting a homeless animal is a life-saving act, saving not only that animal but allowing the Organization to accept another animal into that foster family previously caring for the dog you have adopted. The adoptive family MUST demonstrate a willingness, ability, and commitment to provide humane & compassionate care and understanding, good nutrition, exercise, and training for the lifetime of the new dog. Your new companion may be with you for 12+ years. Are you willing to undertake this long-term commitment in spite of potential changes in your life situation? In addition, are you willing and able to take on the cost of a new dog, which could readily add up to several thousand dollars annually, particularly if a serious medical issue arises? Primary adopter/caregiver must be at least 27 years old. ALL members of the household MUST be in agreement, and supportive of the decision to adopt a dog…..and MUST agree on the dog ultimately adopted. All other animals in the household MUST be up-to-date on all vaccines and on a monthly heartworm preventative. All other animals in the household over the age of six months, MUST be spayed or neutered (unless there is a medical reason for not doing so). It is not necessary that you own your home but if you are a renter, you must provide written consent from your landlord that a pet is permitted to reside in your residence and that there are no restrictions (breed or weight for example) that would impact your decision to adopt the particular dog of interest to you. Adopting the dog of interest MUST NOT result in violation of any municipal ordinances, homeowner covenants, or other such contracts, codes, or agreements. Furthermore, the number of animals within the household MUST NOT exceed the number allowed as stipulated in such contracts, codes, or agreements, and there are no breed restrictions resulting in your inability to adopt the breed of interest. Adopting the dog of interest should not invalidate your homeowners insurance policy. We strongly recommend that you confirm it does not. A secure fenced yard (fenced on all four sides) is not required but is preferred (Note that for some dogs, a secure fenced yard may be required.) The adoptive family must commit to NEVER keep the dog chained outside, or left outside without adult supervision under any circumstances. A fence deposit of $150 may be required if you do not have a fence and a fence is required for the dog you wish to adopt. The new dog MUST wear a collar and identification tag AT ALL TIMES once he/she leaves B.A.A.R.K.’s “Safe House,” even though he/she is microchipped. Most adults find it necessary to work outside of the home; this should not deter you from wanting to adopt a dog. However, if the dog has to be left home alone for more than eight hours, it is in the best interest of the dog, and you the caretaker, to provide a dog walker so that the dog has the opportunity to get outside and exercise. Doggie Day Care 2-4 times weekly is also a wonderful way for your dog to enjoy the company of others, make new friends, and burn off some energy!! When left alone, your new dog MUST be kept in a secure and pleasant environment in which he will be safe and he/she will not get into trouble! Some dogs, particularly those under 12 months of age may require obedience training. In such a case, the adoptive family may be asked to accompany the pup through a group or individual obedience training class, and provide written confirmation of completion. If this is the case for your new dog, a $150 obedience deposit will be required, and held for a period of three months, during which time the class must be completed. Upon receipt of proof of completion, the check will be either destroyed or returned. 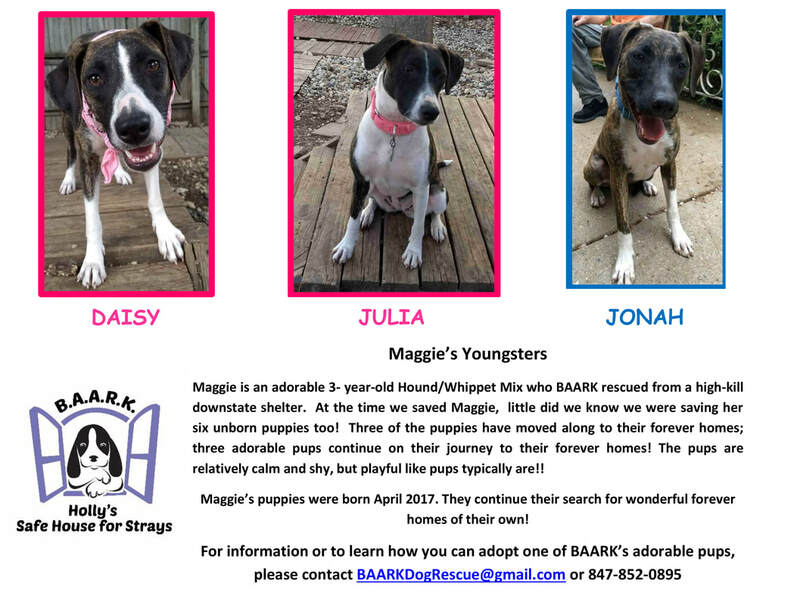 If the pup to be adopted has not yet been spayed/neutered due to extenuating circumstances, B.A.A.R.K. must require a $150 deposit. Arrangements for the spay/neuter must be made within 30 days, as required by Illinois State Law 225ILCS 605/3.3, or in accordance with a veterinary consultation. Once the procedure is completed and proof of spay/neuter received by B.A.A.R.K., the check will be either destroyed or returned. A home visit, and meeting with all members of the household is part of the adoption process and must be agreeable and acceptable, as part of the adoption approval process. Please complete all questions on the Pre-Adoption Application provided, to the best of your ability. There are no right or wrong answers. We want to learn more about you and your household, so we can provide the most successful adoption experience possible. ​The Pre-Adoption Application does not commit you to adopting a dog from B.A.A.R.K., nor does it guarantee you will be approved for adoption of a dog from B.A.A.R.K.. Typical adoption fee for adult dogs is $350. The adoption fee for senior dogs may be slightly less. The adoption fee for puppies begins at $400. Please note that B.A.A.R.K. reserves the right to refuse any adoption for any reason. B.A.A.R.K. does not discriminate as to race, religion, national origin, or gender preference, in placing any dog in his/her forever home. Again, we thank you for your interest in undertaking this lifesaving commitment. Complete B.A.A.R.K.s Pre-Adoption application in its entirety. Prior to submitting an application for a particular dog, we encourage you to research the breed so that you understand the characteristics and needs of the animal. After submitting the application, a B.A.A.R.K. adoption coordinator will contact you (assuming you are the primary caregiver to/adopter of the new dog) to review your application and conduct an initial phone interview. A representative of B.A.A.R.K. will contact your references and verify the veterinary information that you have provided on the application for pets currently or previously owned. Please be sure you inform your references that you have provided their contact information to B.A.A.R.K. and that they will be contacted. If, at any time during the adoption process, we conclude that the dog of interest is not a good match for your household, your application will be kept on file for one year. You will not be required to complete another application during that time period if you find another dog you are interested in adopting from B.A.A.R.K. Dog Rescue. After the initial phone interview, if B.A.A.R.K. has decided that the dog of interest to you may be a good fit for your household, a “meet & greet” will be arranged, either at the home of the foster family or at your home. If the first visit is preferred to take place at the foster home, a second visit will be arranged at your home. B.A.A.R.K. will bring the dog of interest to your home for a meeting with ALL family members and ALL other pets within the household. The purpose of the home visit is to ensure that the dog you have chosen is appropriate for your living situation and lifestyle. Please note that ALL FAMILY MEMBERS AND ALL FAMILY PETS MUST BE PRESENT FOR THE IN-HOME INTERVIEW. More than one meeting may be required during the adoption process to ensure the best placement possible for the dog and the household. When you have made the decision to adopt a dog from B.A.A.R.K. Dog Rescue, we ask that you to spend 1-2 days thinking about the decision, in order to ensure that you are making the best choice for the dog and your family. A same day adoption is NOT an option. Once the decision is made to proceed with the adoption, an adoption contract must be reviewed, completed, and signed. B.A.A.R.K.’s adoption fee is non-refundable. You may also be asked to provide a separate check(s) of $150 as a fence deposit, obedience training deposit, and/or spay/neuter deposit. Check deposits will either be destroyed or returned upon completion of the required action.